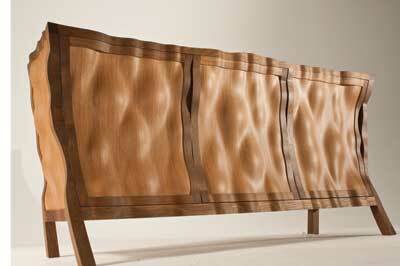 Edward Johnson caught the eye of F&C editor Derek Jones for his sideboard "Volumptuous" which was the inspiration for our technical article on the use of 3D veneer in issue 176. It's rare that such a young maker produces something so interesting in terms of design and on top of that it was executed to a level of excellence. Having shared the story of his triumph over this incredible material with us, we wanted to meet the man who's attempting to start his career at the top. 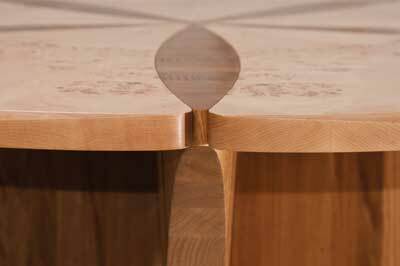 Edward Johnson trained in Furniture Design and Craftsmanship at Bucks New University under the guidance of Hugh Scriven and Richard Williams. After leaving with a first he went into industry for a few years, doing a lot of work for Johnny Grey. The work was interesting, a lot of curves and free standing pieces and a lot of kitchens but that's not where he wanted to be in terms of quality of work. Spending his lunch breaks drawing the designs he really wanted to be making he asked himself, "Do I work my way through a design company and start at the bottom and take 10 or 15 years to become a senior designer, or do I start to get my ideas out there a lot earlier than that and be my own boss?" 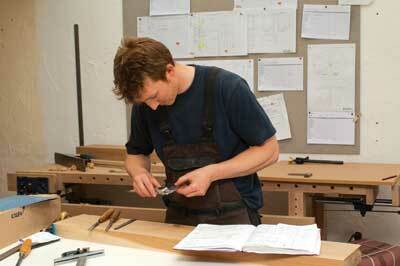 He opted for the later and a year later he's settled in at Scott Workshops in Portslade's old village. Setting up a high-end career from scratch is tough. Affording time to make such speculative pieces as Volumptuous, which bait the private clients with high disposable income, and earning enough bread and butter, is a fine balance, as it is in any creative industry. Edward sees himself as having stepped ahead of the game, which is partly attributed to advice he received from Richard Williams. "You've got to be prepared to go from day one. Have your business plan all done and dusted." He sees the value in the time and effort he took preparing his business. "My company's infrastructure is at the same stage as other cabinetmakers that have been running for four or five years, which gives me more time to concentrate on making money." Commissions are slow and difficult. Getting to private clients is hard especially when you're aiming at the highest end. I'm not happy doing a lower quality of work so in order to get the right price I have to aim right at the top. I've had good feedback so far but I need a break." Some might read this and hear arrogance, but, as David Savage pointed out in his 5 Steps To Success in issue 176, young designer-makers need a certain amount of hubris if they have any chance of getting near where they want to be. Edward does a certain amount of work for interior designers and architects but finds it frustrating working to somebody else's design. "I end up doing other people's work. Rarely is a project viewed in a practical and technical light, basic issues that should be resolved at the design stage are left to me in the workshop. In these early days though this is my bread and butter money. I'm reluctant to devalue my brand and keen to maintain my integrity so I feel more comfortable when someone else's name is attached to that quality of work." These comments do raise a question about whether it's a good idea to be so protective of one's craft... or is that art? "Yes, definitely. It often surprises people when I say the making is just a means to an end. I admire fine dovetails, but I don't think that's what makes a piece of furniture. I consider design and function in unison, contemporary furniture can be simultaneously a functional object and a work of art – functional art. You wouldn't hang your coat on a painting, and you shouldn't need to dress a fine piece of furniture." This in turn raises the question about who gets to decide what art is, the maker, or the buyer. On the other hand, it's surly true that the higher you reach, the higher you'll get. Of course, the chances of getting as high as you want to be are slim, which could mean a permanent state of dissatisfaction. But that's standard territory for a self-confessed perfectionist. "That's what makes us bad businessmen. We get carried away." So what's the starting point in terms of a creative process? "I tend to start with a beer in my hand. Being a maker, it's really hard to lose inhibition. You're so focused on the making side of it that to design, to think outside that box, is actually quite difficult. A beer always helps me clear my mind and think laterally." Once there's an idea he goes to CAD for the dimensions then he draws it out full size on a rod and makes mock-ups. 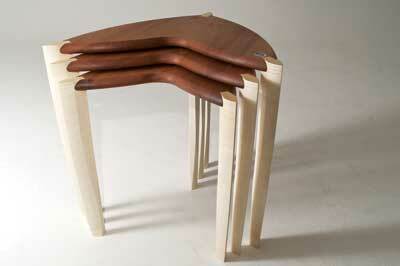 And once the design is in, is that it, or does it develop through the making process? "The beauty of designer makers is that the designing stage doesn't stop when it's drawn up, you can still change things. It's a work in progress right until the end." What about inspiration? 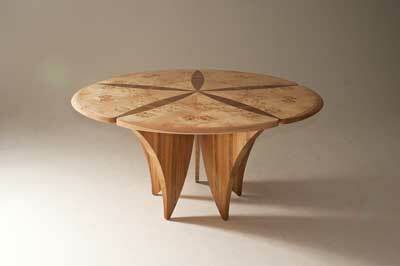 "I try not to look at furniture designers too much. I think it narrows your vision. To be original you've got to detach yourself and take your inspiration from more elementary subjects. But he does mention Matthew Burt, Joseph Walsh and Gareth Neal, who he admires for their problem solving and the organic shapes of their work. "They're using traditional methods but trying to solve some fairly complicated movement issues of solid timber. Whatever shape they come up with, they'll make it work through various technical aspects that they've developed, allowing the wood to move and do what it's going to do." With regards to spotting style movements or influences in his own work he's unsure, "I'm reluctant to categorise my work at such an early stage, I'm only just starting to see a trend in my work. I take inspiration from basic elements, such as natural forms, abstract shapes or a particular function that needs solving, so each project is undoubtedly different. "I'd like to see more creative and lateral thinking within design, but I'm all too aware of the dangers involved with this. It's a fine balance between being accepted by the consumer and pushing boundaries, and invariably you need a good budget to develop ideas." Edward intends to spend some time forming a high-end client-base who will allow him to have his head in terms of design. Ideally he'd like his work shown in art galleries, as opposed to "rooms full of wood" in reference to the more traditional exhibition space. But it's very difficult to catch the eye of London Art Galleries, any furniture seems to be so abstract it has no function at all, there's no middle ground. "This echoes the desires of many new makers we've spoken to on the subject. Perhaps they should get together and make it happen... just a thought. Scott workshops is a cooperative workshop and most of the making is done on site with the exception of work in metal, glass, fabric and spraying. It is a friendly, creative place with a wide and varied level of skill which the makers can draw on. Edward admits that the workshop has opened his eyes a bit. Previous experiences of being surrounded by people who kept their secrets very close to their chests caused him to assume that this was standard practice. But it would seem that Scott Workshops is a generous place where ideas and tips are allowed to flow freely and he now recognises that the more you give out, the more you tend to get back. It is nice to meet a young maker who admits that they still have much to learn and are open to doing so.